HOW IT WORKS: All #1 International songs of 2017 were included and ranked according to their longest stay at the No. 1 spot. The cut-off period for Inter Top 10 is from the first charting week of January 2017 until the week of December 23-29, 2017. Watch the music videos of our Top 10 International songs of 2017 below! 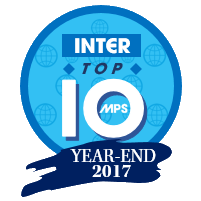 See what fans has to say about the Inter Top 10 MPS Year-End 2017 results! 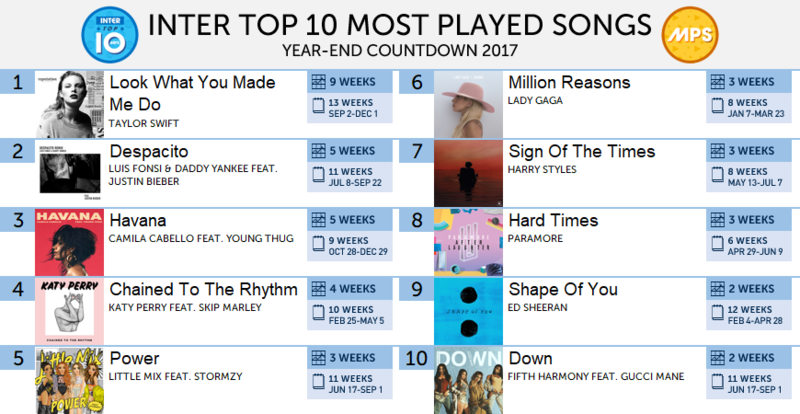 Taylor Swift reclaimed her crown on Inter Top 10 Year-End 2017 with "Look What You Made Me Do" spending 9 consecutive weeks on top of the chart. Luis Fonsi, Justin Bieber, Paramore and Ed Sheeran debuts in the year-end countdown while Harry Styles and Camila Cabello debuts as solo artists. Congratulations to all the artists who made it at the Inter Top 10 Year-End 2017! Thank you for making 2017 a very good year in the music scene!